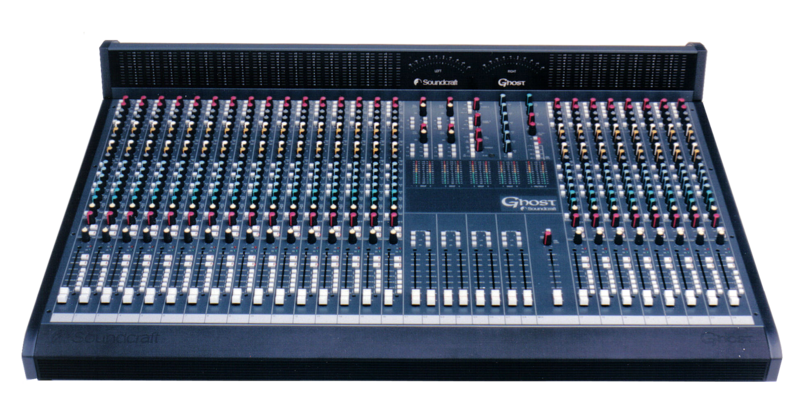 Designing good audio mixers has never been easy - but with the widespread use of ultra-quiet digital recorders, and improvements all through the live and studio audio chain, today’s mixers have to stand up to closer sonic scrutiny than ever before. At the same time, mixing has become less a process that takes place at the console alone, and more one that involves outboard effects, samplers, and synchronisation of audio and video recorders. It’s a big task for a mixer to keep in touch with all of that - which is why Soundcraft created Ghost, the ultimate affordable analogue recording console. Simply put, Ghost is the only desk that delivers the audio precision, quality and all the control features of a big studio desk without the usual prohibitive price ticket. The EQ, for instance, is directly comparable to that of the classic Soundcraft 3200 and Europa consoles. No compromises. An all-new mic preamp, ProMic, has been developed just for Ghost. Its performance alone puts Ghost into a different league from other consoles of similar price. The killer punch, however, is delivered by Ghost’s integral computer-based machine control and mute automation. Derived from the innovative Soundcraft DC2020 post-production console, the machine control in Ghost makes it far more than just another mixer. It actually forms the heart of an automated recording setup with countless benefits in ease of use and production efficiency.